“If abortion is about women’s rights, then what were mine?” asked Gianna Jessen, according to the L.A. Times. Jessen has cerebral palsy resulting from a lack of oxygen during her mother’s attempt to abort her. 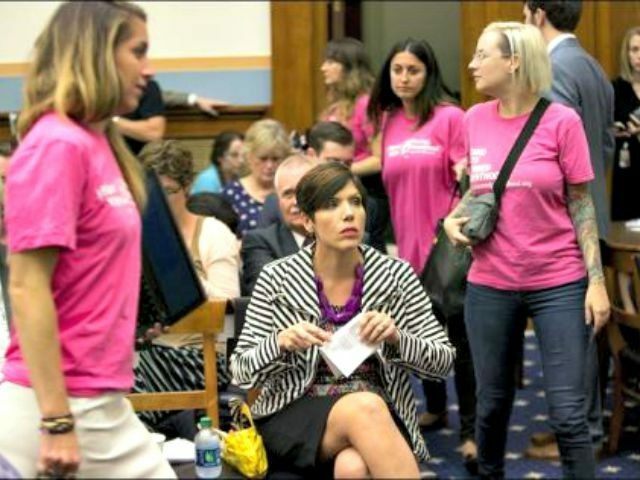 “I’m here today to share a story not only to highlight the war of abortion taking place at Planned Parenthood, but to give a voice to other survivors like me,” Melissa Ohden said, adding that her mother attempted to abort her when she weighed less than three pounds. Doctors told Ohden’s parents she had little chance of recovering from health-related side effects, she told the committee. “The United States of America is a unique nation that is premised on the foundation that all of us in the human family were created equal, and that each of us is endowed by our Creator with this unalienable right to live,” he said. Noting that 18,000 late-term abortions were performed in abortion clinics throughout the country last year, Franks called for the defunding of Planned Parenthood, an issue that is placing GOP House leaders, and specifically House Speaker John Boehner, in a bind as the budget battle looms and conservatives want Planned Parenthood out of that budget. Rep. John Conyers, Jr. (D-MI), the committee’s ranking minority member, said the hearing was one-sided. “There is no credible evidence that Planned Parenthood violated the law,” he said. Committee chairman Rep. Robert Goodlatte (R-VA), responded to those members of the committee who have asked why the investigation is not focused on Center for Medical Progress, which produced the videos exposing Planned Parenthood’s practices.